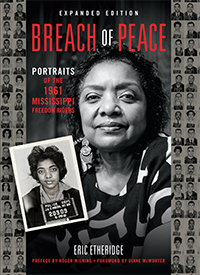 Sixteen portraits from Breach of Peace have been included in the exhibition Road to Freedom: Photographs of the Civil Rights Movement 1956-1968 at the High Museum in Atlanta.
. . . even as the show pulls together so many photographs of landmark events like the Selma-to-Montgomery march in Alabama, the police attacks on peaceful demonstrators in Birmingham, Ala., and the Montgomery bus boycott, it highlights how much history has come close to being lost. One series, of a Greyhound bus firebombed outside Anniston, Ala., during the 1961 Freedom Ride, had been kept for decades in the files of a law firm as potential evidence. Another group of photographs, including one of a row of Molotov cocktails, came from the daughter of a Birmingham police detective. Mr. Cox heard of her by chance. Then Ms. Hunt came to the preview for the exhibition. “They had to run us out of the museum because I read every single thing by every picture, and I cried,” she said. Who would not be thrilled to be part of such a show? My portraits hang in a small room called the Wedge Gallery, along with my picture of the chess set Byron Baer made in Parchman (just visible in photo above, at the apex of the Wedge) and a mural of 100 of the Freedom Rider mug shots. See more pictures of my room in this Flickr set. Road to Freedom is up through October 5. If you’re anywhere even remotely near Atlanta between now and then, the exhibition is more than worth the effort. I read your beautiful book and was very inspired. congrats on all your very well deserved success and recognition.